One of the most depressing things about living in Hollywood is definitely the boulevard of broken dreams’ “Walk of Fame.” While I smile at the names of long lost silent stars and radio personalities, I am endlessly saddened by the teeming masses of tourists that trample daily right on over John Gilbert, Bebe Daniels, Pola Negri, … without a clue or a care in the world. There are in fact more people snapping photos and posing in front of Donald Duck’s star than Jose Iturbi’s or The Andrew Sisters— who happen to be Donald’s neighbors in cemented eternity. Hitherto there hasn’t been any real way to comprehensively navigate the boulevard without spending unnecessary cash on books or guides. 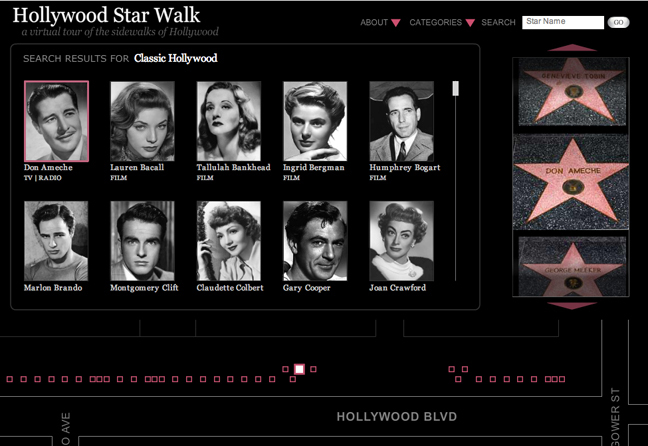 Now the Los Angeles Times has a fun new application on their site that is a virtual tour of the Walk of Fame— this labor of love is an educational resource that can be navigated by genre (film noir, silents, classic Hollywood, etc.,) or by name. The photos, bios and factoids are truly a terrific introduction to Hollywood history. Check it out and contribute if you can!